Information Board on Filey Brigg. Os grid reference: TA 1268 8163. Close to the cliff edge at Carr Naze (Filey Brigg) at the north-eastern side of Filey and near to the Country Park is the “site of” some faint rectangular earthworks of Filey Roman Signal Station. This was the southern-most signal station of five along the Yorkshire coast, and was in use from roughly 375-410 AD; it was manned by a small garrison of soldiers, with the rocky ‘spittal’ (mooring place) below the cliffs being used as a natural harbour for Roman sailing vessels. 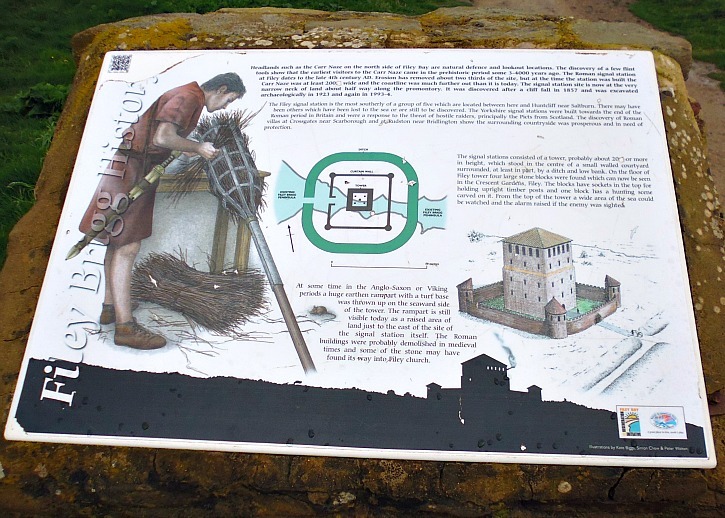 Filey’s Roman signal station, along with the four others, would have formed a defense against attacks by sea-borne invaders from across the north sea. The beacon on top of the tower would be lit when invading ships were spotted on the horizon, acting as a warning to the other stations along the coast so that evasive action could be taken. In a recent landslip part of the earthwork (two thirds) at the eastern edge disappeared over the cliff and the rest of the site is in ever constant danger of going the same way. 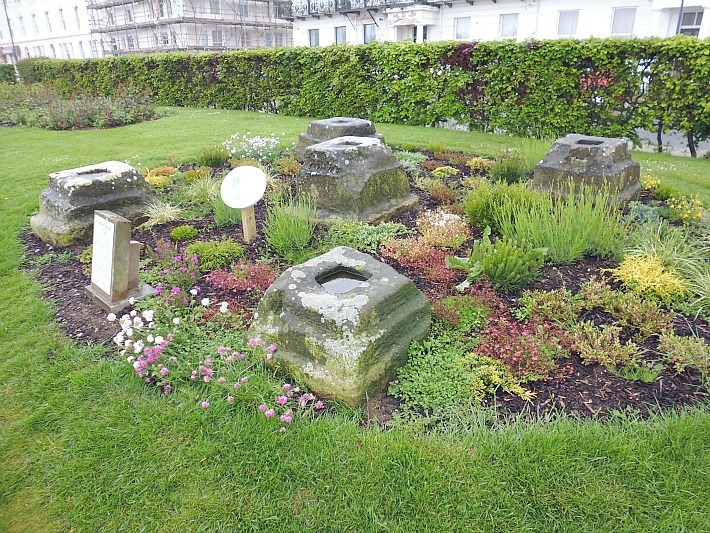 Carved Roman Stones in Crescent Gardens, Filey. The station would have measured 50 metres across with the tower (beacon) at the centre 30 metres high and 14 metres square; the tower being surrounded by a walled structure or courtyard with a gate at the western-side. In the mid 19th century the earthworks were quite visible as was its surrounding bank or rampart – most noticeable at the eastern-side. Upon discovery of the signal station in November 1857 excavations took place at the request of a local reverend gentleman who owned the land and, five large stone blocks were dug up – these most probably supported the first floor of the tower itself; the five stones now stand in Crescent Gardens, Filey, each one having been nicely carved on all sides and having a square aperture 6 inches wide and 3 inches deep at the top, one has a faint carving of what could be a dog chasing a deer! Also, a wall and the foundations of the signal station were discovered some 4 feet below the ground. 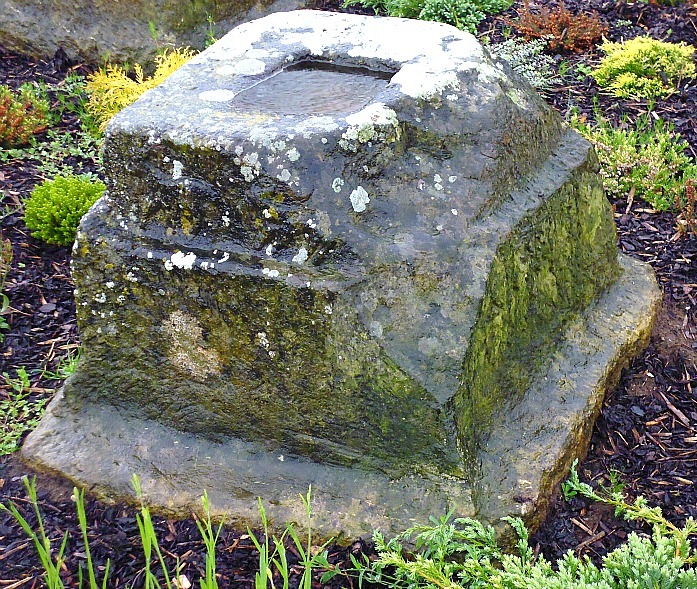 Carved Roman Stone in Crescent Gardens, Filey. Further excavations took place in 1927 and again in 1993-4 by Y.A.T with help from S.A.H.S funded by English Heritage and Scarborough Council – and a number of Roman artefacts were found including bronze coins, pottery and animal bones. Undoubtedly the Roman signal station would have been an impressive sight when fired-up and enough to scare any would-be invaders long before they reached the east coast. The earthworks of a post-Roman building (perhaps a Saxon chapel) can be seen at the east side of the signal station but this is, as yet, unrecorded. A three foot high bronze statue of the god Mercury was found in the eroded cliffs by the signal station – and now resides in The Rotunda Museum, Scarborough, along with a few other Roman finds from Carr Naze. The museum also houses the famous ‘Gristhorpe Man’ which was excavated in 1834. It is the skeleton of a Bronze-Age man who had been buried inside a hollowed-out oak tree near Gristhorpe Cliffs at Cayton, Scarborough (NGR TA 0937 8323). An information board now stands on the site of the Roman signal station, close-by a World War II bomb crater. Categories: Filey Roman Signal Station, Roman Sites | Tags: Filey Roman Signal Station on Carr Naze in East Yorkshire, Roman Sites | Permalink.